Have you ever tried to talk to somebody who thought they were better than you? It’s hard, isn’t it? It’s so frustrating, and at times even infuriating. We’re in the middle of an event in which Jesus is trying to help a man named Nicodemus. But Nicodemus, though he came to Jesus, won’t accept his teaching about being born again. Intellectually he finds it ridiculous. But in this second half of the story we find that Nicodemus’ problem isn’t intellectual; it’s much deeper. Nicodemus, in a sense, has a love problem. In fact, despite all his knowledge and all his religious practices, he has never really experienced God’s love. Though he won’t listen or take Jesus seriously, in response Jesus tells him about the love of God. In our study today we especially want to think about the nature of God’s love, the evidence of God’s love, and why it’s so important to believe it. May God open our hearts and speak to us personally through his word. Look at verse 9. Jesus had just explained how someone is born again. It’s the work of the Holy Spirit, which is even more powerful than the wind. But Nicodemus keeps asking “How?” not because it’s too hard to understand, but because he doesn’t want to understand. Asking questions is always good, but repeating questions after an explanation has just been given reveals that the person isn’t listening. Most likely, Nicodemus was trying to avoid the truth of what Jesus was saying because he didn’t want to change. So what does Jesus say to him now? Look at verse 10. Jesus rebukes him. As a teacher of Israel he should have understood the need for spiritual rebirth, and how God can make that happen in a person’s life through his Spirit. Jesus goes on. Look at verse 11. Jesus has told Nicodemus of what he knows and has seen, which means it’s true, but Nicodemus just won’t accept his testimony. In his rejection of what Jesus is saying Nicodemus in a sense represents all the people of his time. So Jesus says “you people” here. Though Jesus came to reveal God’s truth to them, they would persistently reject him. They were stubbornly unbelieving. They were being irrational. And there was another problem. Look at verse 12. The “earthly things” are the new birth, which happens by the Holy Spirit. To explain it, Jesus used earthly experiences like being born or like the wind. They were simple and easy for anyone to understand. And they were just the beginning of what Jesus would like to explain. He wanted to go on to heavenly things. It probably means describing the things of God. But since Nicodemus couldn’t understand even the earthly things, he wasn’t ready to hear about the heavenly things. To a man who prided himself on his education and intellectual training, it was humiliating to hear. Jesus goes on. Look at verse 13. Here, “the Son of Man” refers to Jesus himself. This verse is telling us that Jesus is unique. He’s the only one who came from heaven and who has gone into heaven. As such, Jesus is uniquely qualified to speak about heavenly things. Why is he saying this? It’s because Nicodemus has reverted to thinking that he’s above Jesus. After all, Jesus has no academic credentials, while Nicodemus has the best ones. But Jesus is so far superior to even the most educated person, because Jesus uniquely came from heaven. So Nicodemus’ real problem was his pride, which was making him spiritually blind. Pride still really gets in the way of people listening, learning and believing. But Jesus doesn’t stop here. Because Nicodemus has come to him seeking, even though he’s being stubborn and not listening, Jesus goes on to give yet another illustration. Jesus really wants to help him. Look at verse 14. Jesus tells the Bible story of how Moses lifted up a bronze snake in the wilderness. As a Bible teacher Nicodemus was surely familiar with it. At that specific time the Israelites were complaining about their hard situation in the wilderness, right after God had saved them from Egypt. God sent venomous snakes among them as punishment, and many died. Then they came to Moses for help. God told Moses to put a shiny snake up on a pole so that people could see it, and he promised that those who looked at the bronze snake would live. Jesus reminds Nicodemus of this story to teach about the nature of God’s salvation, as well as the nature of belief. God’s salvation, to the human mind, may seem arbitrary or irrational. What’s the point of looking at a bronze snake on a pole when many live snakes are biting at our ankles? Isn’t it better for us to try to fend off those snakes with our own skills, or to remove their venom from our bodies before it’s too late? But God saves us when we look to him alone for our salvation. Ultimately, it’s impossible for us to save ourselves, but God can save us when we accept his way, and when we trust and believe his promise. Just like that bronze snake in the wilderness, so Jesus would be “lifted up.” It’s a veiled reference to his being crucified (12:32,33). The venomous, biting snakes can refer to the devil, or to our sins, or even to some people who may be out to harm us. We are not to fight against those things on our own. We’re not to depend on our own efforts, hard work or good deeds. We’re simply to look up at Jesus on the cross and believe in him. 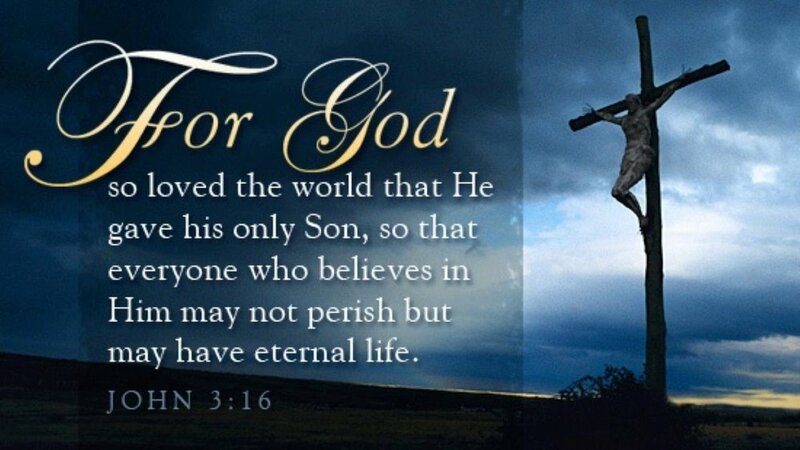 We’re to believe that God will save us from all evil, all sin, all harm, when we look up at Jesus on the cross and believe that he died to save me. God promises us that when we do, we’ll have eternal life in Jesus. Only a humble person can accept God’s way of salvation. Nicodemus was hard to love because of his stubbornness and his pride. But Jesus goes on to tell a man such as him about the greatness of God’s love. Like Nicodemus and like the Israelites, we’re all proud, stubborn, ungrateful, complaining, and too hard to help. But God didn’t give up on the Israelites; Jesus didn’t give up on Nicodemus; and he doesn’t give up on us, either. Read verse 16. The world, meaning all the people of the world, have refused to acknowledge God. People try to live as if they don’t need God. People even use their God-given reason to try to argue against God. Still, God so loved the world. God responds to human stubbornness and pride with love. Why? Because God is love (1Jn4:8,16). In love he created the world. In love he created us. And in love he reaches out to save us, even when we’re not worth saving. So what’s the nature of God’s love? It says “For God so loved the world…” His love isn’t for just some people; it’s for all people of the world. It’s universal. It also says that he “so loved the world that he gave…” He didn’t love, expecting something in return. He loved unconditionally. “…that he gave” also tells us that God’s love isn’t abstract. It’s more than a feeling. It’s rooted in fact, in action. God’s love is giving. It’s self-sacrificing. But God’s love is even more. It says that “…he gave his one and only Son…” It tells us that God’s love is very personal. He gave what was most precious to him. And his love is so costly. A one and only child is so precious to its parents. What parents could give their precious one and only child to others? Even if we have 10 or 15 children, it’s hard for us to give even one of them away. But God gave us his one and only Son. And he didn’t give his Son to nice, trustworthy adoptive parents. He gave his one and only Son to sinners! Paul writes in Romans 5:7,8, “Very rarely will anyone die for a righteous person, though for a good person someone might possibly dare to die. But God demonstrates his own love for us in this: While we were still sinners, Christ died for us.” He’s emphasizing that while we were still sinners, God gave us his one and only Son. Somebody called this “Crazy Love.” Love is usually a little crazy. So when we’re in love, we say, “I’m crazy about you.” But who loves like that? Who gives their one and only child to evil people? God did, and God does. God’s love is so wide and long and high and deep, so surpassing of our human knowledge, we need power even to begin to grasp it (Eph3:18,19). Finally, God’s love is holy. He didn’t spoil us rotten with his love; he loved us in a way that would cure once and for all our fundamental problem of sin. God gave his Son as the atoning sacrifice for our sins (1Jn2:2; 4:10). Christ’s death on the cross is the proof forever that God really does love us. It was so that all our sins could finally be forgiven. It was so that we (even though we’re incorrigible sinners) could finally come back to God (who is holy) and have real fellowship with him and with his other forgiven people. So God’s love is for anyone. It’s unconditional. It’s active. It’s sacrificial. It’s personal. It’s costly. It’s crazy. And it’s holy. For God’s love to do its changing work in our lives, we just need to open our hearts and accept it. Our world is so hungry for love. People are so lonely. So many are depressed. So many are wounded. So many are angry. People try to act self-sufficient, but in their deep hearts what they really want is true love. No human love can satisfy our souls. Only God’s love for us in Jesus can. May God help us fully accept his love for us in Jesus, the only love than can heal us deep within. And may God help us grow in his love until we can master how to show his love to others. Read verse 17. Many people condemn other sinners in their hearts, especially those that seem really despicable. Many people also condemn themselves for their own sins. But God doesn’t want to condemn anyone—not even the worst sinner. God wants to save everyone! Unfortunately, many so-called Christians don’t represent this God very well. They’re quick to condemn various kinds of people, with many righteous reasons. Later we’re going to see how people wanted to condemn a woman caught in the act of adultery (Jn8:1–11). But God sent his Son not to condemn any sinner, but to save sinners. Apostle Paul, who used to persecute Christians, wrote: “Here is a trustworthy saying that deserves full acceptance: Christ Jesus came into the world to save sinners—of whom I am the worst” (1Ti1:15). Then, though God so loves and though he sent his Son to save, why do some people still stand condemned? Read verse 18. Those who believe in Jesus are not condemned (Ro8:1,33,34). But those who refuse to believe in Jesus, God’s greatest gift of love, condemn themselves. It tells us that rejecting God’s love is the greatest sin there is. Why do some people do this? Read verses 19–21. Some people love darkness more than light. They don’t want to stop doing what is evil. They love sin more than truth, more than God himself. Believing God’s love means coming into the light of Jesus and letting it expose my evil deeds so that I can receive Jesus’ grace. In this way, God is glorified in our lives, not we ourselves. There’s no other way. Read verse 16 again. May God open our hearts to his great love and help us believe it. May he help us come into the light of his love, grow in his love and imitate his love that does not condemn.